PROVIDENCE — There was little debate and no public comment before the Coastal Resources Management Council (CRMC) voted unanimously Dec. 12 to approve the liquefied natural gas-cooling project proposed for the city's industrial waterfront. But the audience provided plenty of noise throughout the 40-minute meeting. The 100 or so attendees showered the CRMC board with catcalls and pleas, urging members to reconsider. After the vote, State and Capitol police shielded board members from the protesters and escorted them from the building. Prior to the vote, National Grid rebutted issues raised at the two previous public hearings. National Grid’s attorney, Robin Main, noted that the project isn't a storage facility and isn't going to increase the amount of LNG already stored on the 42-acre site. The gas-cooling facility will operate until 2049 or 2050, she said. Project manager Anthony LaRusso said the new buildings fit with the tan color scheme of neighboring structures, and at 108 feet is shorter than the 127-foot-tall gas storage tank it will sit next to. He said the facility’s primary purpose is to meet natural-gas demand during cold spells, making it necessary to keep company-owned storage tanks in and around Rhode Island full of natural gas. “This liquefaction project fulfills that need of supply diversity,” LaRusso said. Opponents booed and groaned at LaRusso’s reluctance to admit that National Grid didn't have a written plan to dismantle the liquefaction facility in 30 years, the end of its expected life. James Boyd, CRMC’s coastal policy manager, noted that the facility’s ground elevation of 21 feet exceeds the 2050 estimate of 19.5 feet for sea-level rise plus a 100-year storm. At the outset of the hearing, CRMC executive director Grover Fugate said the council was limited to reviewing the coastal effects of the facility in relation to enforceable policies, part of which is the projects's scenic and visual impact. The life and decommissioning of the natural gas-cooling plant were also part CRMC’s review. Safety and public health, however, were removed from state purview and instead examined by the Federal Energy Regulatory Commission (FERC). CRMC’s attorney, Anthony DeSisto, said FERC has the final say on social-justice issues, as well as public health and safety, according to the National Environmental Policy Act. During a brief discussion period, council member Jerry Sahagian said the visual impacts were minor and the structure didn't stand out on the city’s working waterfront. 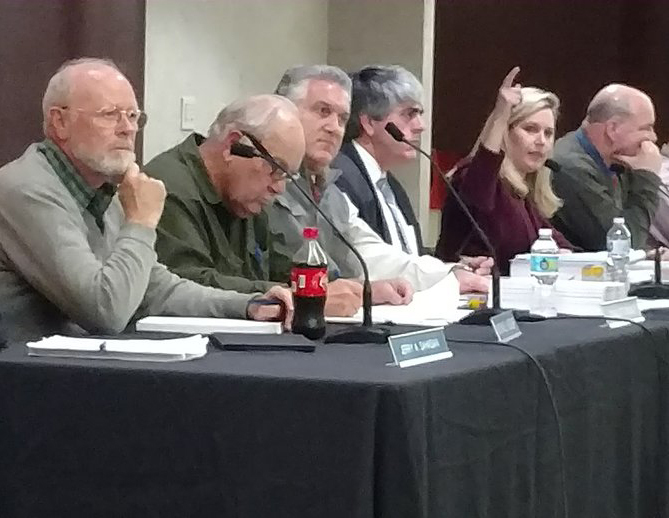 After the meeting, Fugate told ecoRI News that he wanted to have more say regarding coastal impacts, but was told by the National Oceanic and Atmospheric Administration (NOAA) that FERC has that authority. “I understand the frustration,” said Fugate, referring to the vocal opponents of the project. Opposition groups such s No LNG in PVD and the Rhode Island Chapter of the Sierra Club challenged CRMC’s assertion of federal jurisdiction. Earlier this month, the groups made public records requests for e-mails between CRMC and NOAA. In a letter to the board, the Sierra Club stated that it filed a complaint with the state attorney general. DeSisto said the e-mails aren't public under the state Access to Public Records Act. He said he would provide the documents to the attorney general for review if asked. CRMC board member Michael Hudner tried to justify and soften the outcome. The board failed to take up member Donald Gomez’s request that National Grid reduce the life of the facility from 30 to 25 years. The board approved its limited scope of review of the LNG project 8-0. Members Lisette Gomes and Joy Montanaro weren't present. National Grid intends to have the liquefaction facility built and operational by 2020. Air- and water-pollution permits are still outstanding from the state Department of Environmental Management. FERC is expected to issue an environmental assessment by the end of March. Other federal permits are expected 90 days after FERC issues its report. Numerous media stories, led by Uprise RI, reported that CRMC chairwoman Jennifer Cervenka had an apparent conflict of interest in the LNG project because of her work on behalf of National Grid when she worked for the Rhode Island Chamber of Commerce Coalition. The chamber endorsed the LNG project. No LNG in PVD sent letters to the state ethics commission and Gov. Gina Raimondo seeking Cervenka’s resignation from the CRMC board. At the outset of the hearing, Aaron Jaehnig of the Rhode Island Chapter of the Sierra Club — dressed as Santa — handed a letter to Cervenka demanding her resignation.